The Newest Rant: Ranking The Three New Snickers Flavors Because, Um, Why Not? Ranking The Three New Snickers Flavors Because, Um, Why Not? As I grow older and increasingly fragile I have tried to eat better and be more physically active lest I die while still too young to officially complain about, "Kids these days." Plus, I don't want to have eaten so much junk food my corpse is already self-preserved and so full of McDonald's debris even the gators at the zoo I've instructed to have my body thrown into the pen of shall refuse to eat me. That said, I still struggle to drink less soda and will enjoy a candy bar from time to time. 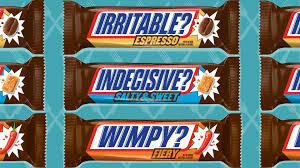 One bar I am a fan of is Snickers. They recently launched three new flavors and I tried them all. I shall rate them from my favorite to the flavor I hope to never taste again. This is perfect. It still tastes like a Snickers bar but has just the right extra bit of saltiness infused within it to result in a bit of an extra kick. I was very pleased with this flavor and count it among my favorites now along with the regular flavor and the version with almonds. While not bad by any means, I find the coffee flavor overrides the taste of this candy bar being a Snickers and results in what feels more like a generic mixture of chocolate, caramel, and coffee flavors. It's okay, in other words, but I won't be rushing back to have more. I like chocolate with spice, having had hot coca infused with chiles and other things of that nature. That said, this is just terrible. It at first tastes like a Snickers with some extra spoiled ingredient mixed in and then your mouth feels kind of hot for a bit. It is just nasty. So there you go, I ate a bunch of candy bars and made a blog post out of it as an excuse to not feel bad for eating all these Snickers bars. Feel free to follow my recommendations or ignore them completely. I personally will be eagerly picking-up more Salty & Sweet Snickers at the store when able and passing on the mediocre Espresso and atrocious Fiery, so now the real challenge is not downing a bunch of these in just one day.